The new mandate, International Financial Reporting Standard 15 (IFRS 15) Revenue from Contracts with Customers, was issued by the International Accounting Standard Board in May 2014 and will take effect on January 1, 2018. The standard offers a single model for revenue recognition from contracts with customers, replacing all previous standards and interpretations. As Vietnam has not adopted IFRS yet, IFRS 15 is not required for Vietnamese entities preparing financial statements in accordance with Vietnamese Accounting Standards (VAS) and regulations. Entities in Vietnam that would need to apply IFRS 15 include those foreign invested entities whose financial information for group reporting is in accordance with IFRS, or those who voluntarily prepare IFRS financial statements in addition to their statutory VAS financial statements. While IFRS 15 is not compulsory for businesses in Vietnam, various dramatic changes in revenue recognition introduced in Circular No.200/2014/TT-BTC for VAS are believed to be taken from IFRS 15, but rationale for the changes provided under Circular 200 are not as comprehensive as those provided under IFRS 15. Therefore, getting to know IFRS 15 will provide local entities with a comprehensive understanding of why such specific rules of revenue recognition are determined by Circular 200; as well as familiarising them with additional areas being considered by Vietnamese authorities in future guidance of revenue recognition in Vietnam. Before IFRS 15, revenue was recognised based on an assessment of whether or not significant risks and rewards have been transferred to customers, and on guidance for specific circumstances, such as sales of goods, sales of services, and performance of construction contracts. 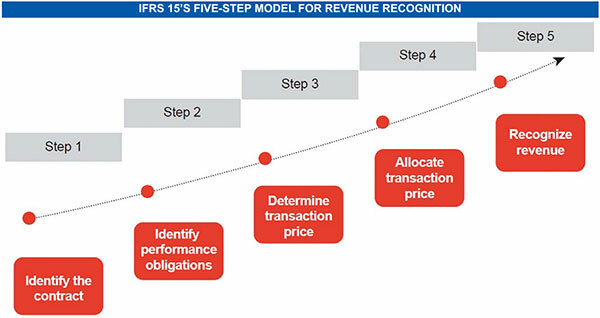 Combining the guidance of previous standards and interpretations, IFRS 15 introduces a single model for revenue recognition which consists of five steps to be followed. It starts with identifying the contract with the customer (Step 1); then determines a number of performance obligations under the contract (Step 2). Subsequently, in Step 3, determinations are made regarding the transaction price, taking into account any contingent payment terms, significant financing elements, non-cash transactions, and other considerations. The next step, Step 4, allocates the transaction price to each of the performance obligations. Finally, in Step 5, revenue is recognised when each of the performance obligations is satisfied either one time or over time. The other two major concepts introduced by IFRS 15 are “performance obligation” and “point in time versus over time”. A performance obligation is a promise to transfer distinct goods or services to a customer. Identifying the separate performance obligations within a contract affects both when and how much revenue is recognised. Identifying performance obligations will be straightforward in most cases, but it will become complex when there is more than one promise in the contract and each of the promises are satisfied at different times over the term of the contract. IFRS 15 requires that a performance obligation for the purpose of revenue recognition be distinct – i.e. the customer can benefit from the goods or services on their own when they are transferred – and that the promises can be separately identified from each other in the contract. For example, Entity A enters into an agreement with a customer to construct a brand new high-end power station. Apart from constructing the power station, Entity A also offers to be responsible for maintenance services for the first year of operations, free of charge. In this scenario, building a power station and offering maintenance services are two distinct performance obligations. A performance obligation may be satisfied at a point in time – typically for promises to transfer goods to a customer – or over time – typically for promises to transfer services to a customer. For performance obligations satisfied over time, an entity recognises revenue over time by selecting an appropriate method for measuring the entity’s progress towards complete satisfaction of that performance obligation. These newly introduced concepts can lead to changes in revenue recognition when compared to previously applied methods. For example, Entity B manufactures a specific car frame for a customer that cannot be used for other customers. Under previous standards, revenue is normally recognised when the risks and rewards are transferred, which is in many cases upon delivery. So, revenue for sales of goods is normally recognised at a single point in time. However, under IFRS 15, as the car frame cannot be used for other customers and assuming Entity B can recover its work up-to-date including a margin, the criteria for revenue recognition over time are met, and Entity B shall recognise revenue over time in accordance with the progress of its manufacturing of the car frame. All types of entities will be impacted by the implementation of IFRS 15 in different ways – be it as simple as the need to reassess all contracts with customers using the five-step model and documenting a conclusion that no change in revenue recognition is needed, or as complex as a need to make a change in both the timing and amount of recognised revenue. Across the network, PwC has performed assessments of the impact IFRS 15 will have on different customer segments. Among those, one recent study shows that the industry impacted most is the telecom industry, in which there would be significant changes to revenue recognition across the entire organisation and the need to create new retrospective statements for existing contracts made in the past. There are three main reasons why IFRS 15 will greatly impact the telecom industry. First, it is not easy to determine a number of performance obligations under a telecom contract, as it can be combined with various goods and services. For example, a contract may contain a provision of a telephone device, a mobile service and internet access, activation fee at the inception of the contract, and a cash bonus. Second, it is not easy to determine the transaction price, as the remuneration can include variable consideration (i.e. phone device provided at below market price, provided a minimum subscription period is used), non-cash consideration (i.e. free gift given), significant financing components (i.e. payment in instalments), and amount paid to customers (i.e. cash bonus at inception of contract). Last, the volume of transactions is immense, creating significant challenges for process and system set-up and implementation. In the end, many changes in revenue recognition under Circular 200, including the deferral of revenue for unfulfilled obligations for customer loyalty programmes, the recognition of revenue for real estate developers upon the estates’ delivery to customers, or the allocation of revenue to free product offered as part of sale transactions, are inspired by IFRS 15. This can be seen as a positive movement initiated by the Vietnamese authorities to bring transparency, improve accountability, help companies and markets to operate more efficiently, and attract foreign capital into the economy. As IFRS 15 takes effect, businesses in Vietnam should not totally ignore this important standard as their business performance needs to be assessed under the integration process into the global economy.